The rollercoaster travelled more than 820,000 miles in its lifetime. Controversial plans for a new rollercoaster ride at Alton Towers have been passed by councillors, subject to English Heritage approval. Details of the new steel rollercoaster, which will replace the 44mph (71km/h) Corkscrew, are being kept under wraps although it will be lower in height. 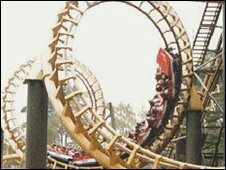 The Corkscrew, Europe's first double-looped rollercoaster, was decommissioned in November. An estimated 43 million people are believed to have ridden it. The new ride, which will open in March 2010, has yet to be officially named, although it has been codenamed "Secret Weapon Six" and will be built on the theme park's UG Land area. An Alton Towers spokeswoman said the new ride's maximum track height would be 20 metres above ground level - 2.17 metres lower than the Corkscrew - and would accommodate 60 people. Mark Kerrigan, head of development at Alton Towers, said: "We consider the type and location of any new ride very carefully to reduce its impact on the environment and local community. "This new attraction will be a more than suitable replacement for the iconic Corkscrew and we hope that it will be attracting new visitors to the resort for many years to come." Staffordshire Moorlands District Council's planning committee passed the plans at its planning committee on Thursday. English Heritage has been consulted because the new ride would enter a conservation area and affect views of the stately home, a listed building after which the theme park is named, a council spokesman said. If they were to object, the plan would be referred back to planners for further consideration, the spokesman added.